I have this old Bang & Olufsen vinyl record player, with a old connector for the speakers. Do anyone know what type of connector this is? And if there exist some converters? Looks like DMX, but it can't be that? Would love to get this to work again. Those are 5-pin male DIN connectors. Same as used in the original IBM-PC keyboard cables. From the photo this is obviously a patch cable of some kind for an audio application. Though your equipment could be wired differently, so it's worth checking carefully with a multimeter to avoid possible damage. It's unlikely that the record player had an amplifier, so it wasn't meant to connect directly to speakers. You've use this cable to connect to an amplifier, then attach the amplifier to speakers. 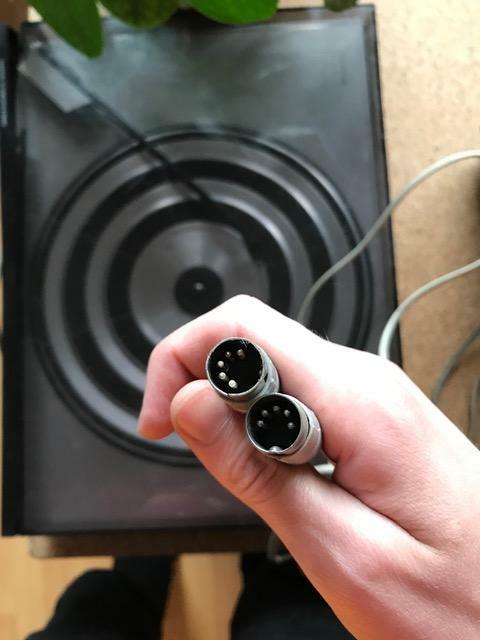 It's a common enough problem, though, that if you search for "Bang & Olufsen 5-pin DIN to rca" you'll find cables you can buy that convert it to the more common RCA audio connectors you'll find on amplifiers today. Still alive and kicking, as a MIDI connector, albeit with only 3 pins connected - the three central ones. 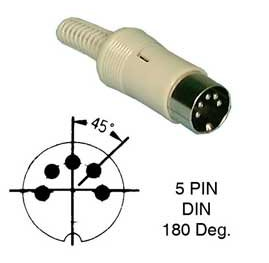 Be aware that there are three sorts of 5 pin DIN plug/sockets - 180 degree, as you have, and 270 degree, for much the same uses, and domino, with a central pin, impossible to get them mixed up when plugging in. Bang and Olufsen equipment were designed to work together very closely, ie, connecting your turntable to tape deck to the receiver allowed the receiver to control the turntable and tape deck directly. Pressing turntable on the remote would power up the receiver and turntable and switch the receiver the the turntable input. This was enabled by having control signals passed between receiver and turntable over the additional pins in the connector. Plain old 5-pin DIN cable, used to be very common up until the mid 80s before, for some reason, RCAs came along and displaced it, even though to do the same job as a 5-DIN you needed four separate RCAs (or two stereo ones each with 2 plugs at each end), all connected to the correct sockets in the right order, and the separate grounds aren't of any benefit when Ground is Ground in all the interconnected equipment. I've got a classic turntable and receiver-amp pair that connect straight together with a single one of these, and it's a total piece of cake. Like a SCART or HDMI for four different analogue audio channels. If the mismatched tape deck that also sits with them was but a few years older it would connect to one of the two-way "tape" sockets on the amp (the turntable connecting to a specific Phono socket, which has a built in EQ stage) with another single cable but, thanks to the standardisation, be able to both play and record using that one lead. As it happens, it is an RCA device, same as the DVD player (well, various different inputs passing though a manual switchbox in truth, but it's the normal user) feeding "tape 2", so I've had to use a 2RCA to DIN-5 converter lead with my fingers crossed that it's the "right" way out for both (got lucky...). I wouldn't immediately have thought it was for speakers, as it's not meant for carrying any significant power, but people have done a lot of corner cutting or otherwise easily enabling hacks down the years, official or otherwise, so it may well be a very strange way of connecting them, with somewhat limited power? The amp I have uses 2-pin Speaker-DIN, breaking out of the same chassis backplane as the line-level connectors... absolutely no chance of junior accidentally plugging something in backwards and making it go boom, therefore..
Not the answer you're looking for? Browse other questions tagged electrical audio or ask your own question. Can anyone identify this light switch brand? What kind of timer socket is this and how can I get it working? Can anyone identify this mystery outlet? What Wire Should be Used for a 40A 240V Circuit?